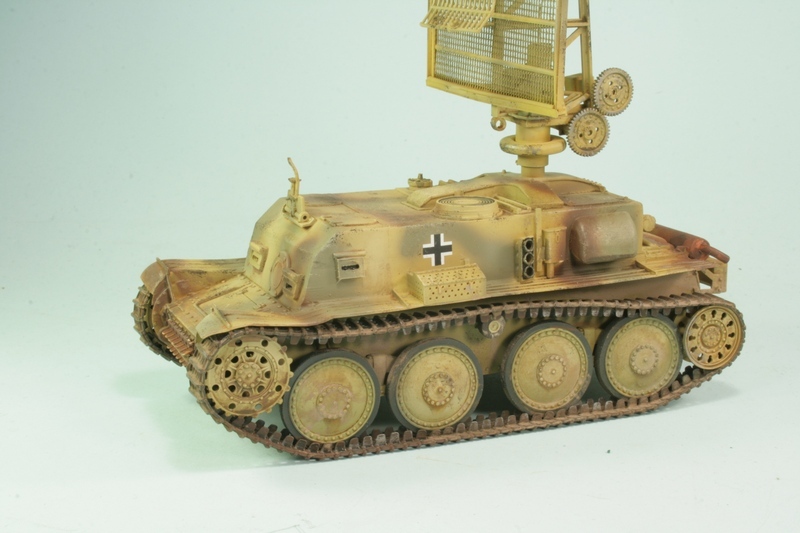 Next AFV Whiffer - German Radar Trager Vehicle - Finished. Ok.. 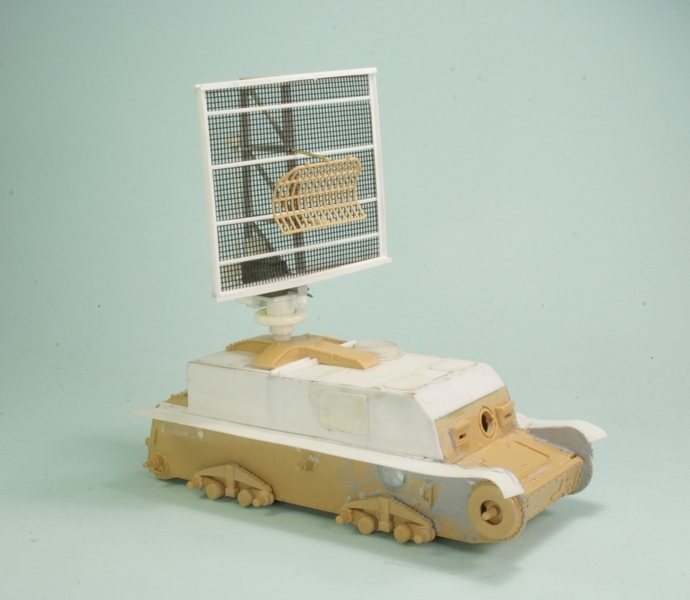 I have done the Rheintochter SP AA missile vehicle so it made some sense to do the radar tracking vehicle for target aquisition. My thinking is that the Germans would use obsolete vehicles for second line jobs. 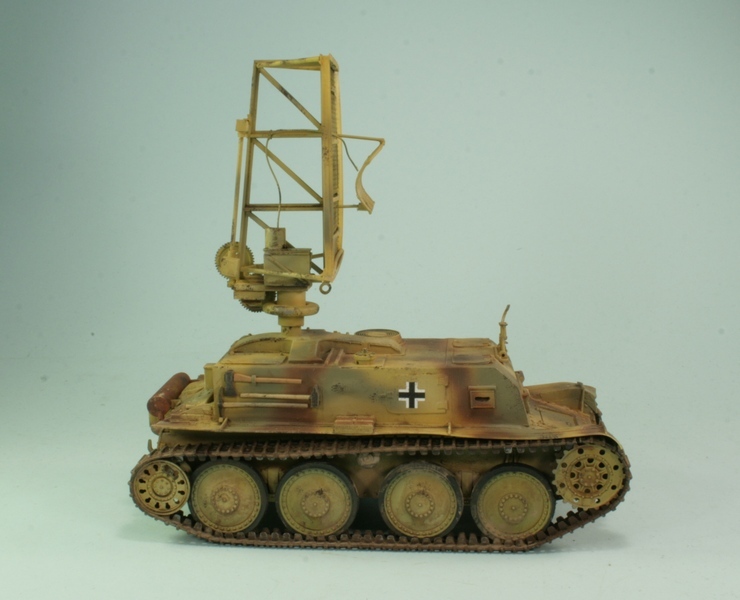 The 38T is the radar carrier with perhaps a SdkFz251 vehicle as the crew vehicle for the radar tracking crew. Clearly there is more to come over the next few weeks. That 251 will be the next build in this series. Definately looks the part to go with your Rheintochter carrier, can't wait to see this one done, as well as the attendant 251. Interesting. Minor nitpick is that any big vehicle antenna should have an ability to fold up or fold down to avoid problems with tunnels and narrow streets and bridges. Yours looks like it has the ability to nod fully down. The cab looks big enough for the system and two operators plus a driver. Maybe a second vehicle with a small wurzburg to actually guide the missile and track the target ?, or one with a co-mounted optical telescope or large binocular with a searchlight. How to reduce carbon emissions - Tip #1 - Walk to the Bar for drinks. Should be okay, the Brits mounted a Type 11 on an Austin K6 in 1942 that didn't fold. They followed it up with more compact versions before the wars end. The hull is maybe a bit tight, but okay for whiff purposes. Thanks for the feedback, but quite aware of most of that actually. Hence why in my whiffworld I postulated that perhaps, maybe, possibly, to have attendant vehicle/s which carried the actual operators, CRT's, tow generators etc. This is merely the array carrier vehicle and size wise the array is smaller than the Freya you have most excellently provided the pix of. Russ, The gears are the start of the fold down mechanism. The array will rotate through 180 degrees and fold down.. well that is what my minds eye reckons anyway. May even become a ground search radar yet. Interesting idea, because there were ground search radars built, as soon as the wavelengths got short enough, to detect artillery and even small mortar rounds incoming- giving a short but useful warning time. These were in use for Korea, so could be whiffed into the 40's. In the whiff-world, technologies either came earlier or not all all, so think about the Reich having early semiconductors and miniaturized tubes like the Nuvistors (I used to use these salvaged from TV's in my tech school radio experiments, got excellent grades and a few FCC violations!). 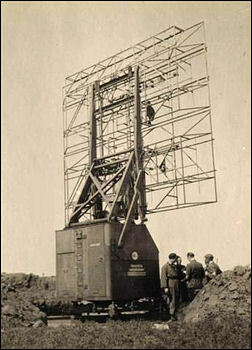 I think your on the right track where your system would work a bit like Himmelbett where big fixed radars like the ones rickshaw provided pics of would give the early warning to control centers which would alert your mobile teams and they would use the set you have made to acquire the target and give the optimum launch time and bearings/elevation to the launcher vehicle. From there you can think of the guidance and either go optical with telescopes and remote controls or go with a pencil-beam radar system, think dish antennas- small ones about a meter or so in size. Neato! Great concept and execution so far, Buzz-looking forward to the finishing! Had a spurt of "get it done" energy and finished a few things in the couple of days off I have had so far. Calling this one done at this stage. Not much added to the first pix. Although looking at it if I was to do it again there is heaps of stuff I would change. Finished in a non specific scheme. 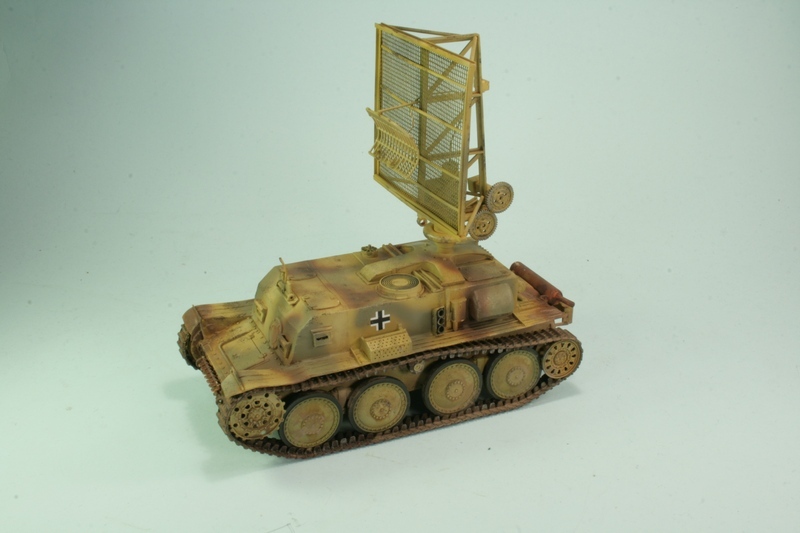 Re: Next AFV Whiffer - German Radar Trager Vehicle - Finished. Also, for some reason, it could almost serve in a diorama as a mine detector vehicle, sweeping roads ahead, on the prowl for the IED's of the era. 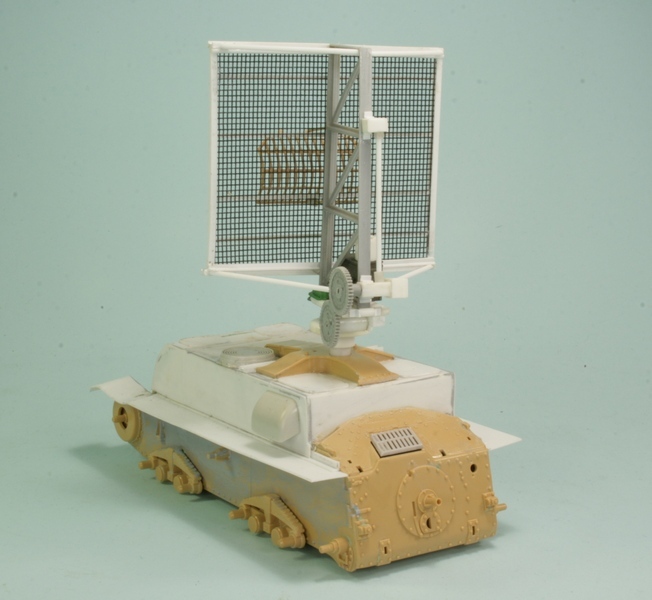 The central antenna radiator is a lot like the minesweeping antennas fitted to period ships. Is there no end to the (whiffing) development potential of the LT vz 38 ?